Heriot-Watt University will ensure their promotion back to the Central Taxis Premier Division tomorrow if they win at Eyemouth United (3pm). Watt’s sole promotion rivals, Duns, chalked up a midweek 2-1 victory over league champions Peebles Rovers to move to within a point of Watt in second place. But Chris Smith’s students can secure the second spot tomorrow and the head coach is eyeing up nothing less than three points. “The boys have been fantastic all season and promotion will be their reward for their hard work,” said Smith. “Luckily for us, Ormiston have lost a few games in recent weeks whilst we have managed to put a little winning run together. Jack Robinson is set to continue in goal for the students, with Craig Saunders likely to remain sidelined. Ormiston have the chance to restore some pride in their final match with Duns at Recreation Park tomorrow (3pm). 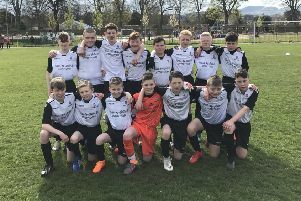 The East Lothian side were thumped 8-0 at Duns last weekend – a result which saw their promotion hopes dashed – but have a chance of some revenge tomorrow. Victory for Duns and a draw or defeat for Heriot-Watt would see the Borders side promoted.